For the Farmer, the Student, the Professional Man, and the Philosopher. 1/1-5, August to December 1901. $1.00 a year. 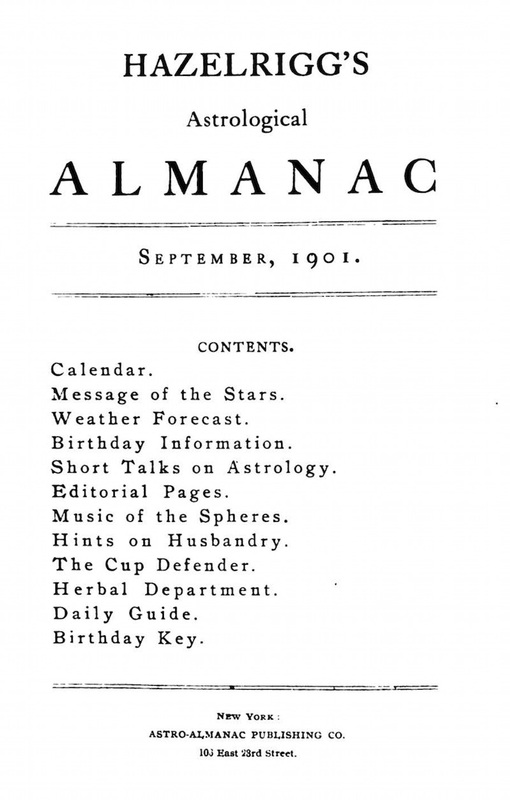 Published by and advertised heavily in The Metaphysical Magazine: "A General Forecast of Affairs, Political, Speculative, Social, and Religious; Also Prevailing Monthly Influences which Will Affect the Individual, as Well as the Nation at Large..." Besides his astrological talents, Hazelrigg was also a fairly learned alchemist, publishing The Book of Formulas (New York: Hermetic Publishing Co., 1904). NYPL; Trinity College, Connecticut; University of Michigan.